It has been over two months since Mayweather Vs Canelo was announced, and i have to admit it took awhile for the news to sink in, because of the magnitude of this kind of fight that we boxing fans rarely get. None the less, here are my keys to victory for this tremendous fight. Why change you’re style when everything you have done in the past has worked? Though Mayweather has said in multiple occasions that he does not watch video of his opponents, you would have to think he has had to watch at least some footage of Canelo. Regardless of who watches video in the Mayweather camp i would tell Floyd to increase the usual pressure just by a little bit. So happens that Canelo’s closest fight was against his busiest opponent, Austin Trout. Trout was busy but was also missing by a lot, something Floyd doesn’t do. Floyd is about as accurate as fighters have gotten. So, if you do the simple Sweet Science math, the more Floyd throws, the more he will land, because he is that accurate. An advantage for Floyd is that Canelo fights almost at the same pace Mayweather does, but obviously Floyd is the superior boxer. It is really hard to give Floyd advise when he has been incredibly good, why do you think in every other round in the Mayweather corner we always hear Roger Mayweather say “Keep Doing What You Are Doing”? Canelo is also unbeaten, but he knows he is still the guy trying to prove something. Floyd is at the top, and Canelo must take it from him. I would start by telling Canelo that his key to victory would be simply “Smart Aggression”. Floyd is the better counter puncher, but not all fights can be won on counter punching. Canelo needs to give Floyd different angles and different work rates. Some folks say Canelo has had stamina problems, but in all fairness, Canelo hasn’t had an opponent that has made him fight outside his comfort zone, Floyd will most likely be the first. Sure Trout was busy, but Canelo found it easier to hit Trout. A big help Canelo has from his punching is that when he lands, you know he landed. Canelo has some of the most beautiful pop shots in recent memory. 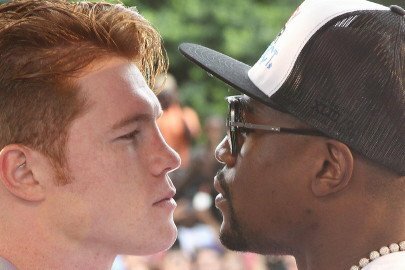 Its going to be hard to hit Mayweather, so that is why Canelo needs to punch more(Smart Aggression). Also Delahoya is not lying about that JAB. Both DeLaHoya and Cotto gave Mayweather legitimate trouble with that. Lastly, Canelo should consider getting back to his body work. There have been so many times where floyd is standing against the ropes and just dodging heads shots from his opponent. nobody has ever committed to Floyd’s body. Canelo has the ability to do damage downstairs, yet he must not forget to move his head at the same time while doing that, again, Floyd is a great counter puncher. We win! Rarely we get a mega fight that we asked for(Props to TMT/GOLDEN BOY). But I must admit i was a little dumbfounded of the fact that, while just about everyone agrees that Mayweather/Canelo is the biggest fight that could have been made (after the Paquiao loss) at the same time everyone has already agreed that Floyd is running away with this. Experts included. How can that be for the biggest match up you can think of in boxing? Only in the Sweet Science huh?. Now sure, Floyd Mayweather is and should be the favorite. But ask you’re self this, out of every fighter that you can think of from 140 to the 154 divisions, who is the biggest threat to Mayweather? How would that fighter do against Canelo? Unless, Canelo “is” that biggest threat to Mayweather. Previous boxing news: WBA # 13 Blake Caparello eyes big fight!